Scooper - Technology News: Does foreign aid have a positive effect on growth? Does foreign aid have a positive effect on growth? The effect of foreign aid on growth is the subject of ongoing debate. It is difficult to determine the effect of aid on growth when aid is an integral part of an economy; there are few "experiments" in the level of foreign aid. Sebastian Galiani , Stephen Knack , Lixin Colin Xu , and Ben Zou , the authors of The Effect of Aid on Growth: Evidence from a Quasi-Experiment (NBER Working Paper No. 22164 ), argue that there are points on a nation's growth trajectory at which aid inflows drop because of the rules donors use to select recipient countries. 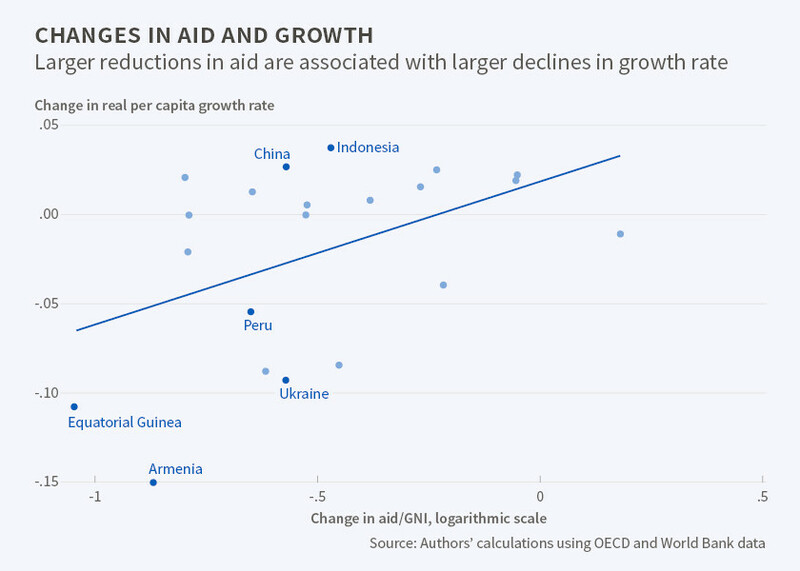 They use the substantial changes in aid around this point to evaluate how aid affects growth, and they conclude that aid has a substantial positive effect. Since 1987, the World Bank's International Development Association (IDA) has defined income thresholds above which countries are generally deemed less needy than poor nations. Other large donors tend to follow the World Bank's lead, and they also reduce funding when nations reach the IDA income threshold. Recipient nations' foreign aid as a share of gross national income (GNI) falls an average 59 percent once they cross the threshold. The researchers posit that if per capita gross domestic product (GDP) falls after aid is withdrawn, the decline can be used to infer the boost in GDP that the nations received while aid was still flowing in. For the 35 countries that crossed the IDA threshold between 1987 and 2010—a group that ranges from China to Peru and India to Turkmenistan—they calculate that a one percentage point increase in the ratio of aid to GNI is associated with an increase of about 0.35 percentage points in per capita GDP. They are careful to point out that this is a short-run effect, and that longer-run effects of aid on growth are difficult to measure.